Every day content programs aimed at consumers, kids, influencers, specialists and business people launch. And all too often this content is developed, distributed, and promoted with no strategic planning; there is little articulation of its intent, its core messages, or of the intended goals. As a result, the internet is awash in content that does not speak to a particular audience, does not provide useful or relevant information, and often delivers mixed and confusing messages. There’s a lot of competition for your customers’ attention – and the best way to get that attention is for your content to be good. Really good. And that doesn’t just mean well written or well produced. Good content is relevant to the target audience, it’s useful and activating, it is tied to your marketing goals, and it feels authentically part of your brand. If you can ensure that your content meets those requirements, then it’s going to work. Your customers and potential customers are going to consume it, respond to it, and share it. The one surefire way of creating great content is to start with a great creative brief. Here’s why: If members of your team or your content agency understand what the business goals and expectations are from the get-go they’re going to do better work. If everyone understands who your brand is talking to and knows what those people want to hear about, you’ll inspire greater focus and creativity, and more engaging, exciting, effective, and activating content. Developing creative briefs may seem like a drag, but a good creative brief is actually a great investment in time, efficiency, and motivation. If everybody on the project knows what they’re doing and, most importantly, knows why they’re doing it, you’re going to have fewer revisions and rethinks later. And, better results. 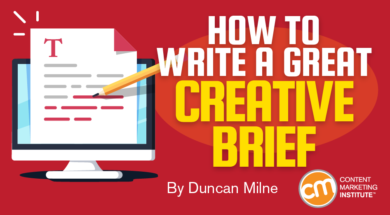 How do you write a great brief? Don’t be so detailed that you stifle creativity. Describe the who and the why, but do not prescribe the how – that’s your content team’s job. Synthesize the important information concisely and clearly. But at the same time, don’t assume prior knowledge. Follow up the brief with as much useful background information as you can. Audience data, brand guidelines, content assets, and previous marketing programs can all be helpful to the content developers. Describe the project, the business challenge, and the opportunity specifically. It’s worth providing context or illustrative examples of other programs only if they provide useful and actionable background. Members of your internal team or agency know the information they need from you to do the best possible work. Get them to help you write the brief. Chances are, they’ll be delighted to provide input. Involve your team, managers, and stakeholders in developing the brief. Getting input means your brief will be thorough and it also means everyone who needs to be on board is. What do you want the people who consume this content to do? How do you want them to respond? How do you want them to feel? How will you measure this? If you define success at the beginning of the project, then you’ll always have something to measure content effectiveness against. 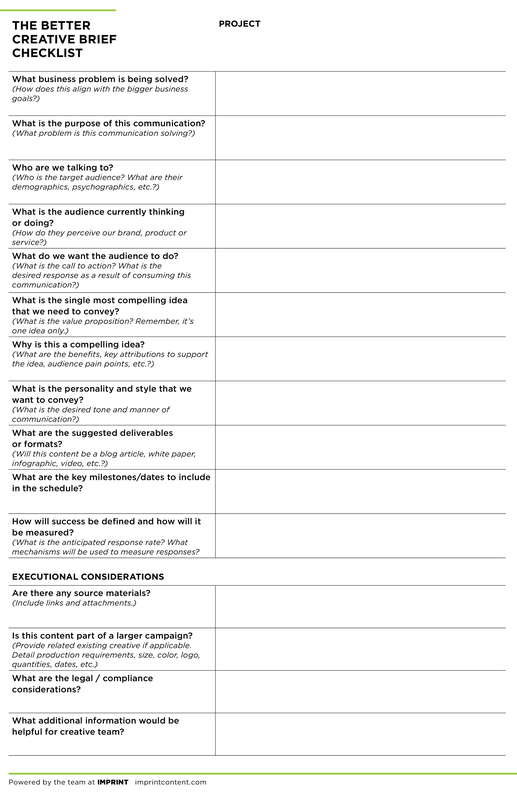 Use the following checklist to help guide your creative brief execution and then ensure that everybody on the team has it to make your content as hard working and effective as possible. Taking the time to craft creative briefs is valuable. It lets your team or agency see – in one view – how their work is important to your company and your audience – and it sets everybody up for success. Do you use creative briefs? What have you found especially helpful? What challenges did you have? Please share in the comments. Want help every day delivering on your content marketing goals? Subscribe to CMI’s free weekday newsletter today! Duncan has worked in the content marketing business for more years than he cares to remember. He has managed complex and high-value programs for companies including Johns Hopkins Medicine, Walmart, Sodexo, Virgin, Whole Foods, Mead-Johnson, Williams-Sonoma and Weight Watchers. Duncan combines a deep understanding of strategy and measurement with a passion for creative and innovative digital content. Follow him on Twitter @ContentDuncan.